1 What is Earwax Buildup? 5 For a video guide on how to get rid of earwax, watch the video below. The ear is a precious piece of the human body, yet it is often underappreciated by the majority of the population. We tend to take our hearing abilities for granted and grab for the nearest Q-tip when an ear wax buildup happens, instead of seeking advice on how to get rid of earwax buildup. We do not consider the consequences these little sticks can have on our ears and we often forget to consider that our ears are the only channel towards hearing what happens on the outside world. While ear wax does have benefits for the inner and middle ear, when a buildup occurs, we have to face the disadvantages of this substance in our ears. The discomfort caused make us grab for the very first object in reach to help remove the ear wax and relief the discomfort. What you might not know, is that the Q-tips you are pushing into your ear is doing more harm than good. Before we take a look at why Q-tips are the most dangerous form of ear wax removal and how you should really clean your ears, let’s switch our focus to what ear wax buildup is. The need for cleaning out our ears usually occurs when a buildup occurs. Ear wax, also called cerumen, is an oil-based substance that is naturally created by our body. The main function of ear wax is to keep dust, microorganisms and foreign particles out of the ear, as reported by Health Line. They also report that in a case where an excessive amount of wax is produced within the ear, the excess amount is naturally pushed out into the opening of the ear, then washed away during a shower or bath. If the excessive amount of ear wax gets hard or gets pushed back into the ear, a buildup can occur. In this case, the excess amount of wax is not pushed out to the opening of the ear, but rather keeps building up inside the ear. 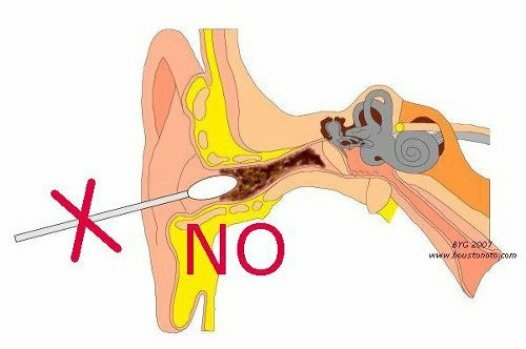 This is where Q-tips come in – when a buildup inside the ear occurs, a majority of the population grabs a Q-tip and tries to remove the wax themselves. Unfortunately, this often leads to additional problems due to the fact that the wax buildup is actually pushed further into the ear. WebMD reports that the use of Q-tips are actually the most common cause of earwax blockages. They also report that some people actually uses other foreign objects such as the corners of a rolled up napkin and bobby pins to try and remove wax from their ears. While a small amount of superficial wax can be removed by these objects, the rest is usually pushed back deeper into the canal of the ear. Rather than reaching straight for the Q-tip, next time remind yourself to at least research the correct procedure on how to get rid of earwax blockage. NHS Choices reports that symptoms of an earwax buildup or blockage can includes a variety of conditions, including pain in the ear, loss of hearing, tinnitus, ear infections and even a spinning sensation, also referred to as vertigo. More than 50% of patients reported that they did in fact use cotton buds to remove ear wax from their ears. 20% of the patients did not agree with the statement that cotton buds can be harmful for the ear. They also did not agree with the statement that cotton buds can cause ear infections. Injuries resulting from cotton bud usage in the ear are amongst the most common reasons for visits to ear, nose and throat referral clinics. The majority of patients who agreed that cotton buds can be harmful for the ear reported they did not use them at all. There were patients who reported using cotton buds to remove ear wax and reported that they agree with the statement that cotton buds can be harmful for the ear. Now that we realize the dangers of the most common ear wax removal method, it is time to take a look at how to clean out earwax without Q-tips. While medical procedures are available to remove ear wax from the ear and to effectively treat an ear wax buildup, a majority of people are looking for a safer way to do this from their own home. There are two main methods that can be used to safely clear the ear from excessive amounts of wax without risking further damage or infection. These methods include the softening of earwax and a procedure known as ear irrigation. Let’s start by looking at the preferred method for cleaning wax out of ears. This procedure involves the use of a substance that softens ear wax. Ear wax can then easily be drained out of the ear without the use of a foreign objects such as a Q-tip. The British Journal of General Practice reports this procedure to be safe and effective. The process starts with a substance that can be used to soften ear wax without adding too much impact on your ear drum or damaging parts of the inner-ear. Get Rid Of Things recommends using mineral oil, olive oil or baby oil as a solution to softening ear wax. Mayo Clinic reports that hydrogen peroxide can also be used as an effective ear wax softener. Use an eyedropper to add a few drops of the preferred substance into the ear. The softening process will take approximately one to two days to work effectively. After this period, an irrigation system is use to gently push body temperature water into the ear canal. The head is tilted and the outer ear is pulled up in order to straighten the ear canal. When the process is done, the water is drained from the ear by tilting the head to the side. Finally, a towel or hand-held dryer is used to dry the outer ear area. Ear irrigation is another useful strategy that can help drain excessive ear wax without the use of additional substances. The strategy only uses water that is close to the temperature of the patient’s body. Health Line reports that using water that is too warm or too cold can cause dizziness. The process can be conducted in either a standing or seated position. The head is held in an upright position and the outside of the ear is pulled upwards (gently). A syringe is then used to push water into the ear. The head is then tilted to the side to allow the water to drain. While this process might not always be as effective as when softening the wax first, no additional substances is required and the process can be repeated for better results. Ear wax is a natural part of the body, but an excessive buildup of this oily substance can cause problems. While the most common thing to do for the majority of patients is to use a Q-tip to “treat” ear wax buildup, it has been proven that the use of a Q-tip causes more damage to the ear and can actually promote the development of infections. 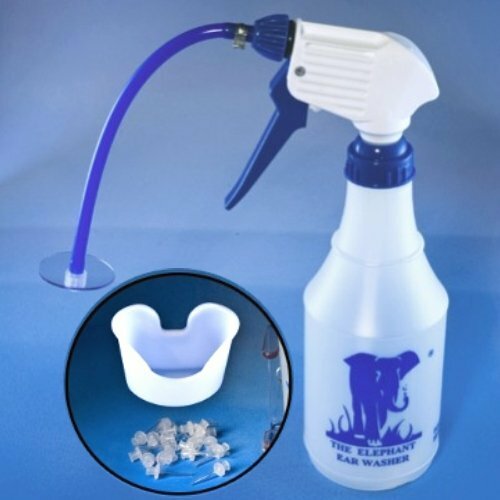 Learning how to get rid of earwax buildup naturally using a safer alternative cleansing method such as softening ear wax and using an ear irrigation system, patients can effectively remove excess wax without risking damage to their ears. For a video guide on how to get rid of earwax, watch the video below. How to get water out of your ears using olive oil. It facilitates the fluid flow stuck inside the ear while its antiseptic properties reduce the risk of ear infections. Rather than figuring out how to get water out of your ears, it is better to prevent the problem by wearing earplugs before taking a shower or swimming in the pool. They help you seal the ear canals and ensure water from getting in.